Since moving to live in California in 2013, I have felt more European than I ever felt while living the other side of the pond. This is especially so when I encounter a culture clash and tipping is one of those areas. 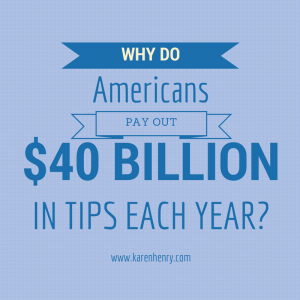 Every year Americans willingly hand over an estimated $40,000,000,000 in tips to service personnel. Forty billion with a b dollars – that’s a lot of cash! So who gets tipped, how much and why? Navigating the tipping minefield starts with who the heck to tip. Why do we tip hotel porters but not receptionists, or tour guides but not docents? There are 31 “tipped professions” in the USA and there is a “tipped minimum wage” here, which is $2.15 and hasn’t changed since 1991. 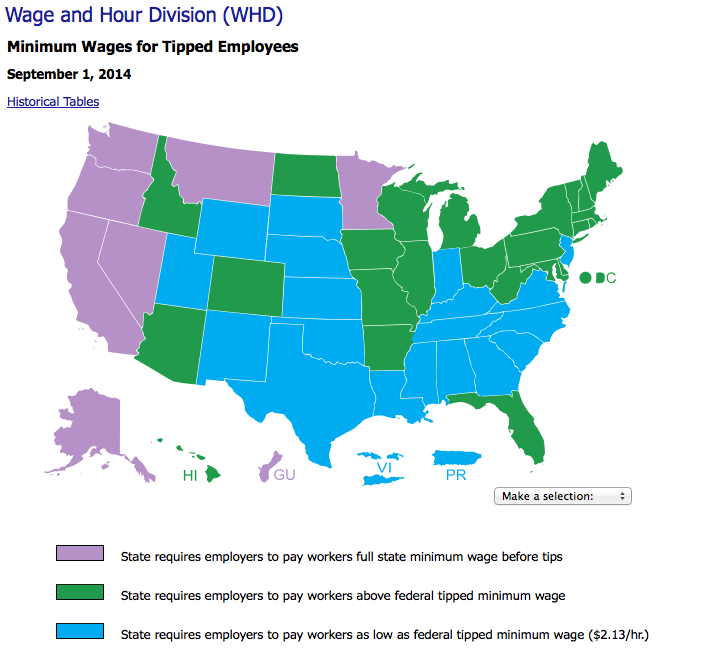 In seven states, including California, the federal minimum wage applies to tipped workers also, and many states have a higher tipped wage, or stipulate a minimum total income. Still, some service workers, for example in Alabama, may only be paid $2.13 an hour, relying on tips to make a living wage. So should we tip service workers in California the same percentage as those in Alabama? I am not alone in asking this; on every destination forum on Tripadvisor, there are hundreds of conversations on when, who, why, how and how much to tip. It seems pretty clear here in California: a tip of 15%+ is easily calculated by doubling the tax on your restaurant bill. But what if a lot of your restaurant bill is for wine? Do you tip on that? If you like nice wine, that alone could add an additional tip of $20 to your bill for the five minutes it took to open and pour your wine. That’s $240 an hour! Should I apply the calculation to the pre- or post-tax amount? Pre-tax based on the double-the-tax formula, but when restaurants present suggested amounts, these are calculated on the total including tax. And what about self-service situations such as coffee shops? I also wonder what motivates us to tip? Guilt? Gratitude? Culture? Please don’t spit in my soup next time? And what exactly is a tip? A tax? A gift? A salary? Fascinating research has been conducted by Dr Michael Lynn, a professor at Cornell University’s School of Hotel Administration. Among many of his studies, some of the most interesting were empirical research into the factors affecting tip levels. What factors affect tip levels? The results of the Cornell studies; do these factors result in higher or lower tips? Good service? Very little correlation. Yes, research shows that the one reason that we are supposed to tip does not affect the amount tipped. So, I’m still getting to grips with this curious phenomenon – any answers to my many questions would be gratefully received!